This is a series of pendant lights made by London-based Jake Phipps. They're made from actual bowler and top hats and they take their name from an early '90s BBC show of the same name. By the way, the show starred now US TV star Hugh Laurie and current Twitter celebrity Stephen Fry. 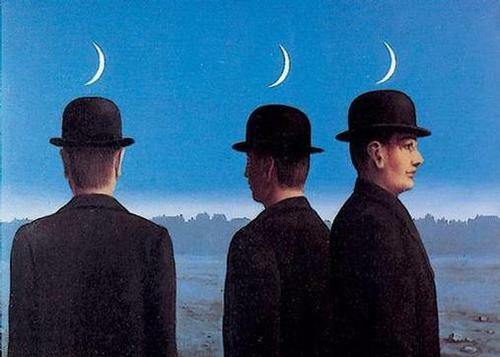 Anyhow, any time I see a bowler hat I think of Belgian Surrealist René Magritte. 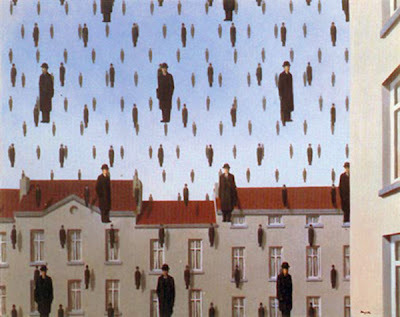 I like Magritte a lot and I've probably said so before on this blog. Here's why I have bowler hats and René Magritte linked so tightly in my mind. As much as I love his art, what I love even more was his perspective on it. visible images which conceal nothing; they evoke mystery and, indeed, when one sees one of my pictures, one asks oneself this simple question, 'What does that mean?' It does not mean anything, because mystery means nothing either, it is unknowable. Words to live by if you ask me and not just a description of paintings. 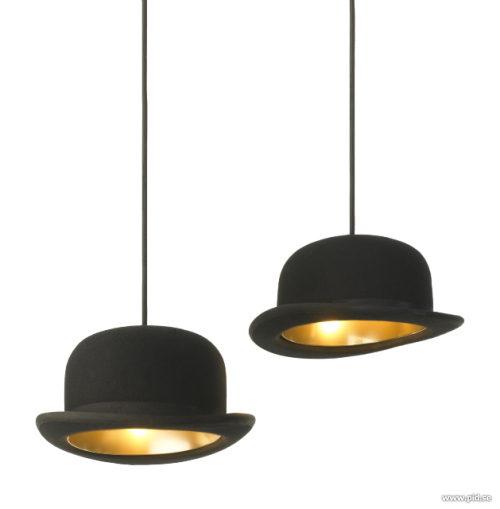 So back to Jeeves and Wooster pendants, what do you think? Would you hang something like this in your home? I absolutely love these! Would be fun to hang one in a powder room or a dressing area. I think they're great too. I get it that the Magritte connection is mine alone, but I'd treat them as an homage to surrealism. These top hat lights are awesome. I saw some hanging in a design store in London but didn't have my camera with me at the time. They looked so cool. What a fun idea! I wouldn't hang them at home, but I would definitely hang them in an office. Marilyn: I'd imagine they are in more than a few places in London. They're quite British. Nicolette: I'd put them in a living room. An art-strewn living room. LOVE for a dressing room, so perfect. Also nice for a dark wood, cozy bar/restaurant! Perfect indeed. Thanks for the comment Lee! 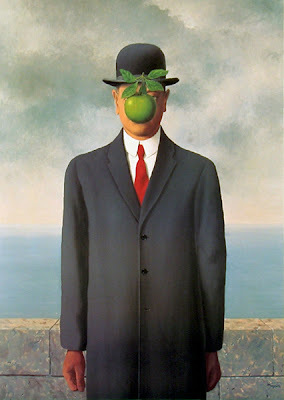 I, too, love love Magritte. They need to be hung at varying heights, a la Golconde. Been a fan of the bowler hat since the Thomas Crown Affair Movie!! Love this light - can see it in a study or man cave!! Gina! Thanks for checking in.